We woke in Little Harbor to gusty winds but mostly blue skies and clear water. SwimVacation breakfast is a largely continental affair, with lots of yogurt, granola, and fruit placed on the buffet. Coffee is important, and even as a lowly decaf drinker, I understand it’s place as a morning ritual. Our yacht Rumba came with a small drip machine, so we purchased a bigger one. The problem is that this boat runs on 220 volt electricity and our brand new 12 cup Mr. Coffee coffee maker runs on 110 volts. What to do with this $35 appliance? Our options are: 1) get a cab ride back to the cash n carry store and wait in line and try to return it without a receipt (lost during provisioning). 2) Fly it back home to Maine with additional bag fee costs of $70. 3) Throw it in away or toss it in the ocean. 4) Give it to Albert and Iris. We chose door #4. A huge green sea turtle welcomed us to our morning swim. The guides planned a swim to an old pier where lots of fish hang out, then along the inside of the bay to the edge of its mouth. 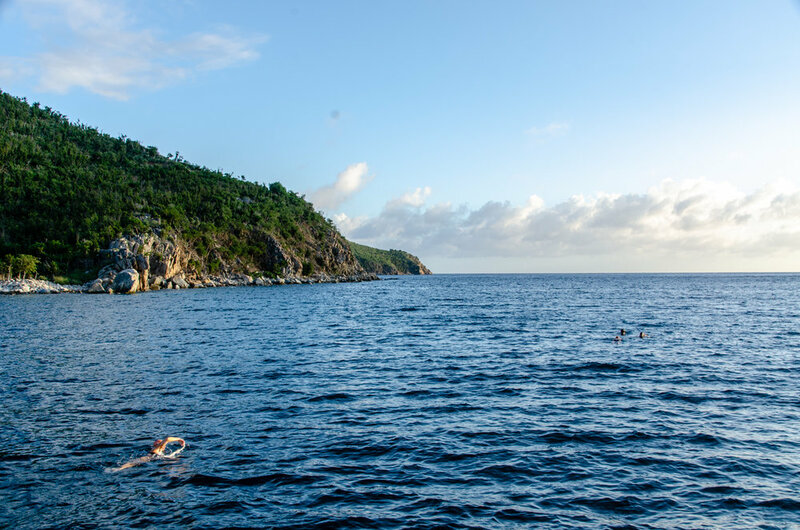 From there, we made the decision to swim along an unprotected length of Peter Island, between Great and Little Harbours. 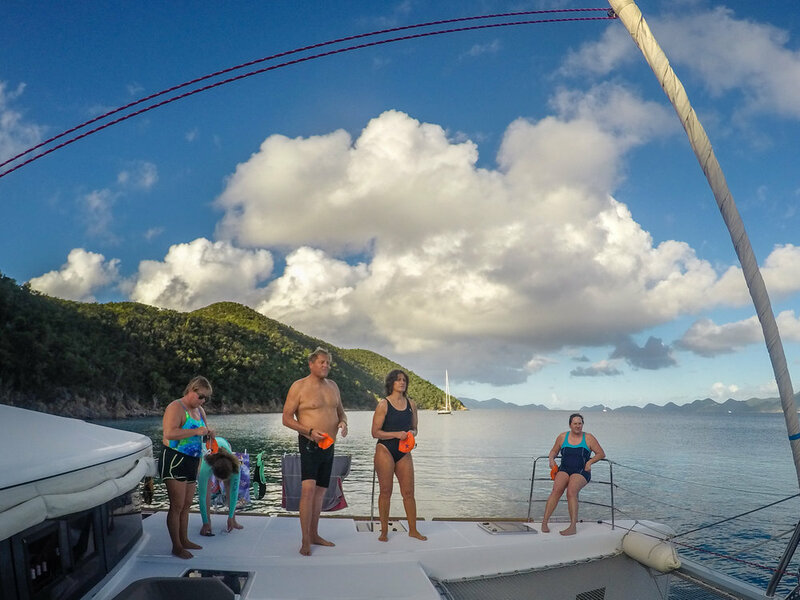 There was a 3’ chop and 15 knot winds in our face, but I thought it would be a good experience for our guests, and indeed they all enjoyed the challenge. 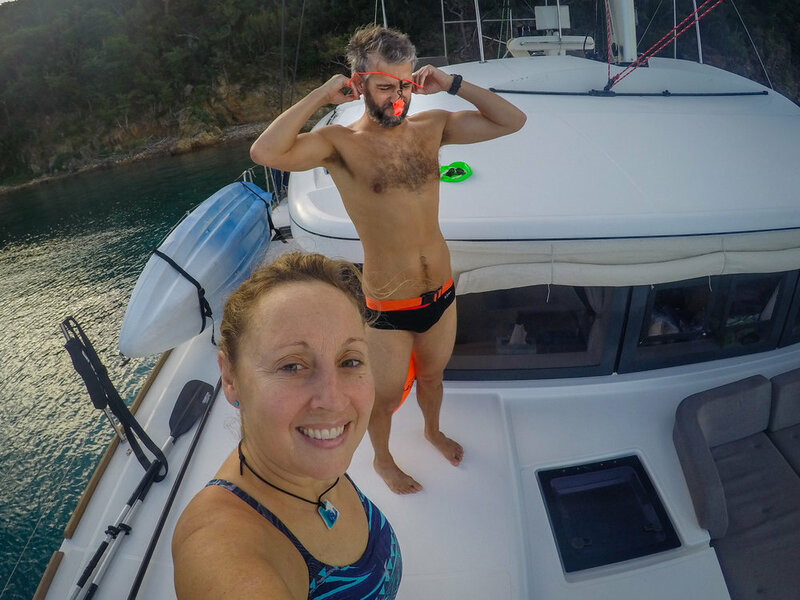 Guest Miriam, a newcomer to open water swimming, has impressed me with how quickly she has taken to the sea. I got to know her a little better yesterday, and she has a fascinating background. A daughter of German and Hungarian holocaust survivors who were denied entry into the US, winding up in Mexico City, Miriam grew up in a Spanish enclave of the City. Educated in the US, which led to citizenship, and now residing in The Woodlands, Texas. She just signed up for our Bahamas trip, two days into her first trip with us. Heather took underwater video of all of our guests, plus me and John, then I took a video of HP’s stroke. This always makes me realize what a difficult task this is, and how long Heather can hold her breath. Back on Rumba, John reviewed the videos with each of the guests, providing tips for improvements on balance, efficiency, and propulsion. It’s nice to do this early in the week so guests can work on their strokes all week. After video, Heather bombed around with her camera underwater exclaiming about the new resident population of the tiny but beautiful jawhead blennies. She says she hasn’t see them in 20 years, and I don’t believe I’ve ever seen them on SwimVacation. And yet, as new populations take hold in the islands after the storm, here they are. It’s fascinating to think about what moves in after destruction, and why. The adorable yellow heads of Jawhead Blennies give life to the sandy bottom of Little Harbour. 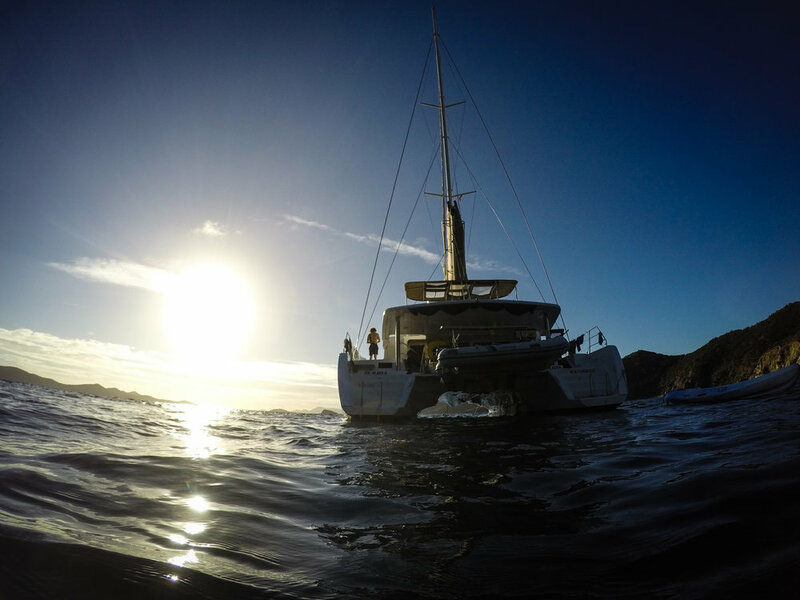 With an eye on the wind and swell direction, we decided to move to White Bay on Peter Island. We’ll be the only boat in here for the next 24 hours, as it’s a tricky sand-bottom anchorage that keeps many new captains away. I grilled some burgers, taking credit for a delicious lunch that was 99% prepared by chef Miriam. Grilling on a boat is always an adventure - it’s usually windy and the grilling equipment it often questionable. Oh yeah, no whining on the yacht. 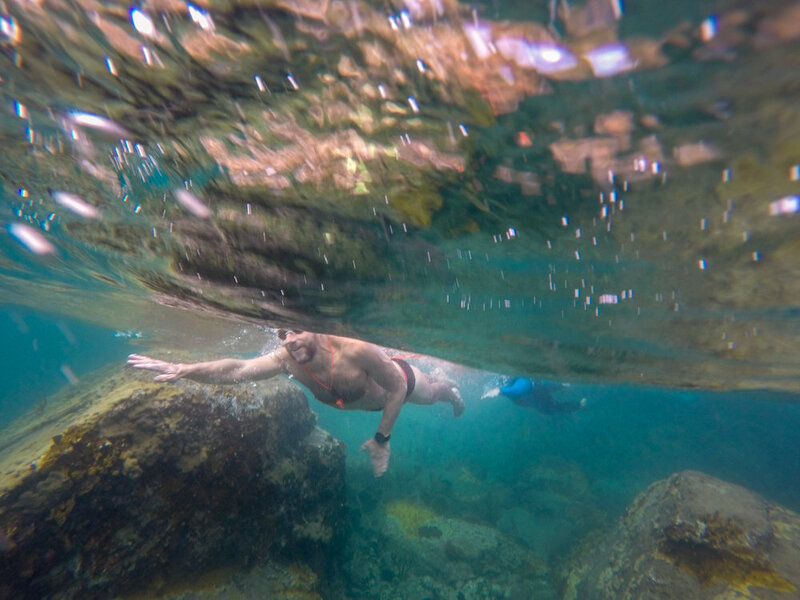 Much like we have seen with the recovery of the people of the Virgin Islands and Puerto Rico, we are also seeing the recovery of the reefs and marine life here, to our great delight. 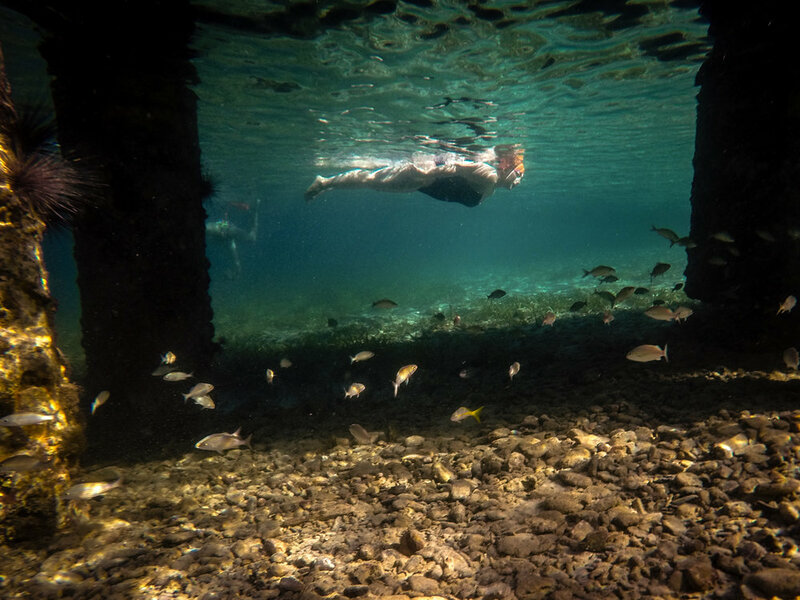 Our afternoon swim brought us to some of our traditionally favorite spots, and we held our breath as we first swam over them. The hurricanes have wiped out most of the shallow reefs here, but these spots were spared, and the reefs that had been damaged are coming back. It’s a bit like a forest recovering from a fire. First, algae appears on the scoured, now dead, coral and rock formations. Microscopic organisms move in to eat the algae, fire coral forms, loads of spiny urchins take up residence. We are seeing baby fish everywhere, and a baby lobster on a rock, unafraid. Jacks, needlefish, and tarpon are back. Angelfish. 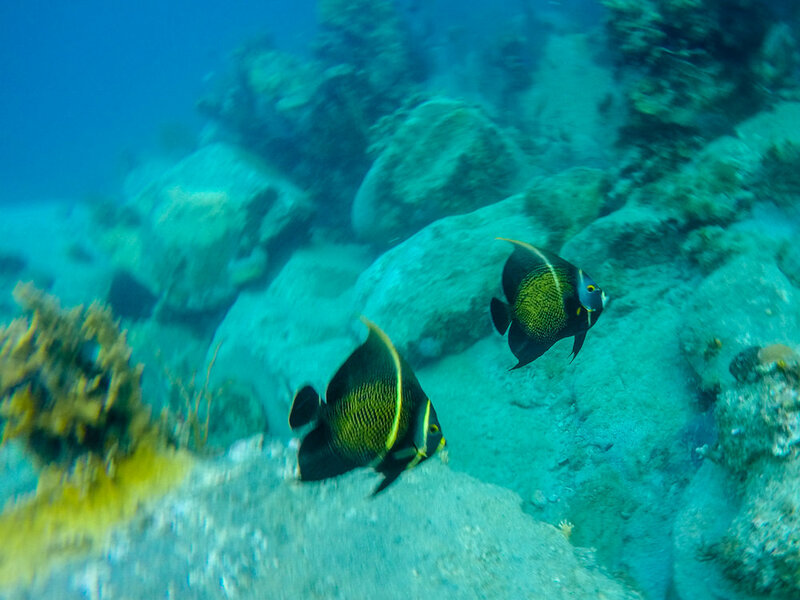 Wrasses, the iconic schools of blue tang. The question remains as to how far the recovery can go in the face of warming seas, but so far, things look promising here. I skipped the happy hour beverage but it looked great and was described as a Caribbean Cosmo. Amy could not stay out of the water, diving back in again and again to see another creature. Susan, who swam for the same college team and coach as I did (URI, Mick Westcott), lives in Alaska. This is her second trip with us, and I’m always impressed that she travels so far for this week of sun and saltwater. 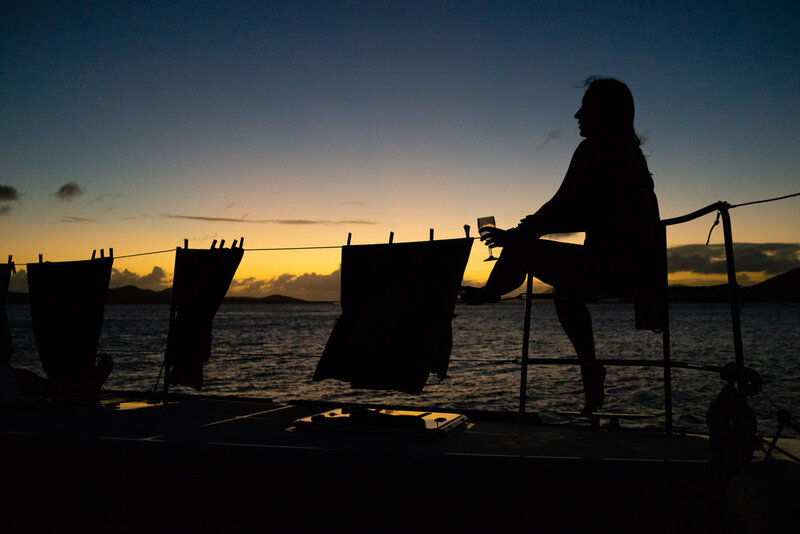 Frequent SwimVacationers Rick and Karen kicked back and enjoyed the setting sun. Rick and Myssie had just wrapped up a long kayak voyage, and they looked ready for some chill time on the stern couches. Rick and Myssie accompany us on kayak on our afternoon swim. Some of our swimmers just couldn’t get enough, jumping back in for more right in the middle of cocktail hour! Imagine! The new moon made for another great starry night. This group has gelled, and I think they’re quite happy. We are not resting on our laurels, however and will stay on our toes for another 5 days. Beyond that, we’ll swim what we’re given and let the sun and sea have their way with us. Sunsets in White Bay never disappoint.